PROFILE: The snooker world champion is regarded as one of the greatest players of all time. 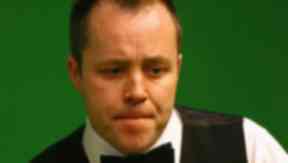 John Higgins is widely considered one of the greatest players ever to wield a cue. One of only nine men to have lifted the World Championship on three occasions, the Scot is even thought by some to be the best all-rounder the game has produced. The 34-year-old also has a reputation for being a first-class ambassador for snooker and has been a key figure in moves to reform the sport and bring it to a wider audience. So there could hardly be a more devastating blow to the game than for someone of Higgins' standing to be filmed allegedly agreeing to deliberately lose frames in return for money. Higgins denies any wrongdoing and insists: "In my 18 years playing professional snooker I have never deliberately missed a shot, never mind intentionally lost a frame or a match." Snooker has, of course, been dogged by such allegations of match-fixing in recent years. But with all due respect to those who have been investigated in the past, none of them has anywhere near the profile in the game enjoyed by Higgins. The man nicknamed 'The Wizard of Wishaw' cemented his place in the pantheon of the greats when he won his third world title last year. That came 11 years after his first, emphasising just how long the provisional world number one has managed to stay at the top. Not even Stephen Hendry, Steve Davis or Ray Reardon can lay claim to such longevity. Higgins turned professional in 1992, during an era where Hendry was virtually unbeatable. But he quickly established himself as the most likely pretender to his fellow Scot's crown, winning his first tournament at the 1994 Grand Prix. Four years later, he became the second youngest world champion after Hendry when he beat Ken Doherty 18-12 at the Crucible at the age of 22. He also ended his fellow Scot's long reign as world number one. Higgins followed that up with his first UK Championship, becoming only the fifth man to win both prizes in the same calendar year. More titles followed until a three-year drought between 2001 to 2004, which coincided with him becoming a father for the first time. But he emerged from this with arguably the finest performance of his career, thrashing Ronnie O'Sullivan 9-2 in the 2005 Grand Prix final, becoming the first player to record four successive centuries in a ranking tournament. A second world title continued to prove elusive until 2007, when he beat Mark Selby 18-13. Two years later, Higgins saw off Shaun Murphy 18-9 to earn a place at snooker's top table. He now faces what he describes as the "biggest match of his life" to repair the damage these allegations have done to his reputation.